I am the founder and president of Gala Investing, LLC. Having earned my interest in the stock market during the dot-com era and subsequent ‘internet bubble’ years, my fascination with the market and all its driving components has only grown, and grown to the point where I can legitimately call myself a full-time trader who has evolved from a fan of the market, to a student, to now an experienced professional day- and swing-trader with a proven track record. During my undergraduate studies in finance and economics, as well as my post-graduate studies in financial analysis, the markets were always something that piqued my interest. My studies in the finance field provided me with a good framework and knowledge on how companies manage their businesses as well as their finances. This knowledge did not immediately help me find direction as to what I wanted to pursue after my studies, but it kept me attached to the financial markets. After graduating with a post-graduate degree from the University of Wisconsin, I did a few small stints here and there but I struggled to find a profession that not only challenged me but also tied me to the stock market. After meandering for a year, I joined with a group as a lead moderator of a community of technically-based traders profoundly aware of the importance of using charts as a key trading strategy, a position I was to hold for several years. Now with several years experience behind me, I serve as President and CEO of Gala Investing, LLC, which operates the Trading Roundtable and tradingroundtable.com. The Trading Roundtable incorporates all the experience gained from now having been directly associated with the markets for many years, the experience of fellow investors associated with the Trading Roundtable and the ability to share potential winning strategies in real-time. The number one attribute I obtained from my early years of trading which has helped me to become a successful trader is recognizing the importance of technical analysis and how it relates to stock picking. I have studied several chart patterns of stocks and the major averages for an extensive time now and am confident that I can spot quality patterns when I see them. I have used these technical patterns on a daily basis to produce consistent returns. Although technical analysis is my primary point of analysis in deciding what trades to take, my research is also accompanied by strong use of fundamental analysis, including looking at earnings growth, sector relative strength, and a lot of the tools that Investors Business Daily uses in their CAN SLIM approach. Tradingroundtable.com currently has two subscriber services, Active Trader and Trader’s Edge Video. 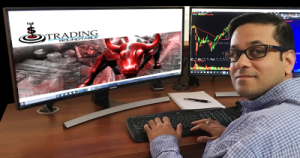 Access to a trader's forum where you can join Trading Roundtable's founder Samit Gala and other acive traders of all experience levels in a moderated board with a constant flow of market commentary, trading ideas, and much more. Because the markets are constantly rotating on news and macro events, it pays to stay on top of this rotation by constantly reviewing charts and spotting sector moves and themes early. A significant reason why Samit Gala has had huge success has been due to the hours spent pouring over data on the weekends, hitting charts and ensuring an eye is kept on every strong chart and sector out there. Though this takes extensive time and effort, it is well worth it in this fast, changing market. Many of you don't have the time to do this on a weekly basis, thus the creation of the Trader's Edge Video. This video is available each weekend and covers the major sectors in the market, with the best underlying stocks within each sector and top candidates to watch for in the coming week, in-depth coverage of the stocks chart with detailed analysis by Samit Gala, as well as added features such as fundamental analysis and any relevant news. The Trader's Edge Video, provided each weekend, provides a birds-eye view of what the Trading Roundtable is watching.